Kale, a richly colored leafy green vegetable, is truly a powerhouse of healthful compounds for the body. In recent times, people have discovered this king of veggies and found some very creative ways to prepare it, making it very enjoyable to eat, even for those who hate their vegetables. Below is a video I created about kale. My video notes are below. Enjoy! Like other vegetables I’ve covered so far, kale is a member of the cabbage family, being a cousin to cabbage, cauliflower, collards, broccoli, Brussels sprouts, and more. Like some other members of this plant family, kale is often referred to as a “super food.” Kale comes in different varieties with curly, or flat leaves, and colors ranging from deep green and blue-green to purple. 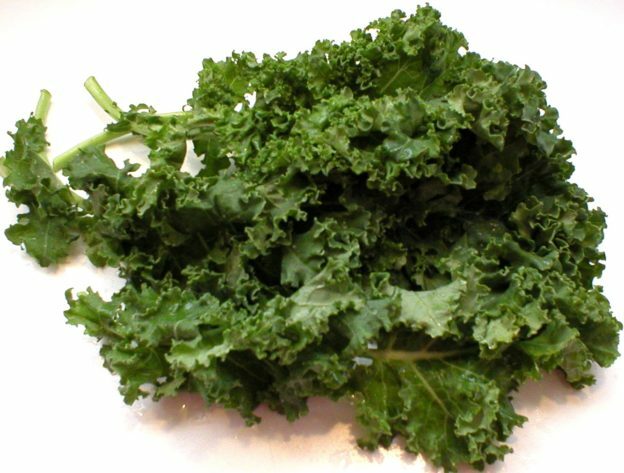 Some common varieties of kale include Curly Kale (Scots Kale), Dinosaur Kale, Ornamental Kale, Red Russian Kale, and Siberian Kale. Their leaf styles and colors will vary, and their flavors will also be slightly different. Kale is an absolute powerhouse of nutrients and is often referred to as one of the healthiest foods to eat. PERIOD! One cup of raw kale has only 33 calories, 2.5 grams of fiber, vitamins A, C, and K, folate (a B vitamin), a little omega-3 fatty acids (alpha-linolenic acid), and important minerals including phosphorus, potassium, calcium and zinc. Kale also contains lutein and zeaxanthin, nutrients that protect our eyes against macular degeneration and cataracts. The anti-cancer and anti-inflammatory effects of kale are well-established in scientific literature. Look for dark, crisp, unwilted leaves. Those with yellowing or brown leaves are older, so try to avoid them if you can. The smaller leaf plants will be more tender than those with larger leafs. Kale should be refrigerated. To help extend the life of fresh kale, wrap the bundle in a cloth kitchen towel (or paper towels) and place it in a plastic bag (even a grocery plastic bag will do) and store it in the refrigerator. As with any fresh vegetable, it should be used as soon as possible, but may keep for a week when wrapped in a towel within a plastic bag. Do not wash your kale until you are ready to use it. If it has gotten a little limp in the refrigerator, place the kale in a large bowl or pot of cold water for about 10 minutes. Then wash and use it as desired. If your stored kale has become soft, discolored or mushy, remove and discard that part before use. Is kale eaten raw or cooked? Kale can be eaten raw or cooked. It is also used in raw vegetable juice blends. Raw kale can be added to salads, smoothies, and added to vegetable juices. The smaller leaf varieties may be more enjoyable when eaten raw since those leaves are more tender than the larger ones. Kale can be cooked in a variety of ways: sautéed, baked into chips, steamed, added to soups, chowders and stews, and added to any number of hot dishes along with other vegetables, grains, and sauces. Steam kale for 5 minutes then add flavorings as desired. See below for more kale recipe links. Frozen kale is often found in grocery stores. You can freeze kale yourself by washing, then cutting it into small pieces. Blanch the kale leaves in boiling water for 2-1/2 minutes, and stems for 3 minutes. Drain and immediately place them in a bowl of ice water for about 3 minutes. Drain well and place in freezer containers or bags, then freeze. The kale will keep for 8 to 12 months. Some people will freeze cut kale leaves without blanching or steaming first. Kale frozen this way will only keep for 4 to 6 weeks and should be used within that time frame. Kale frozen this way can be steamed and stir-fried. This entry was posted in Food, Uncategorized and tagged about kale, how to cook kale, how to freeze kale, kale, kale 101 the basics, kale recipes on February 6, 2019 by Judi.